The Lanas Stop baby sweater is coming along. I’ve finished the body and now I’m working on the sleeves, knitting both of them at the same time. The body of the sweater is worked in one piece with a back button band. After the sleeves are completed, the body and sleeves will be joined and then the yolk will be knitted. This yarn, “Lara” is very nice, although it splits a little, but that is to be expected with cotton yarn. It was certainly a good buy from Elann.com at ~$2 a ball. I found a cute sock pattern to match this sweater and can’t wait to knit them! The other day I went to the bowling alley with family and friends, and knitted while watching six of my favorite guys have a great time. 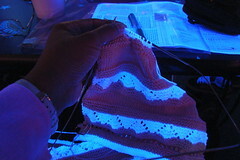 At one point the lights dimmed and to my surprise, the white yarn started glowing! It was cool, and although it was dark, I was still able to knit away. 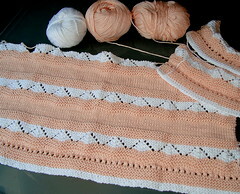 » This entry was posted on Thursday, June 25th, 2009 at 5:43 pm	and is filed under baby, Knit. You can follow comments with RSS 2.0 feed. It’s just beautiful. I love those colors. So soft and perfect for a little girl.